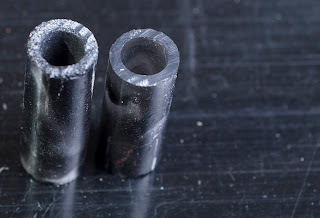 This is part three of the series "Making a pen using a CYOC blank". The way I get rid of the drilling marks, scratches, scuffs, and so on, is with acetone. 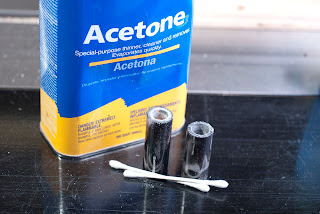 Soak a cotton swab (aka "Q-Tip") with acetone, and rub vigorously inside the drilled holes. It'll probably take several soaks to get everything smooth. You will end up with the hole being hazy white. This is OK, because the paint will saturate the haze, making it disappear.